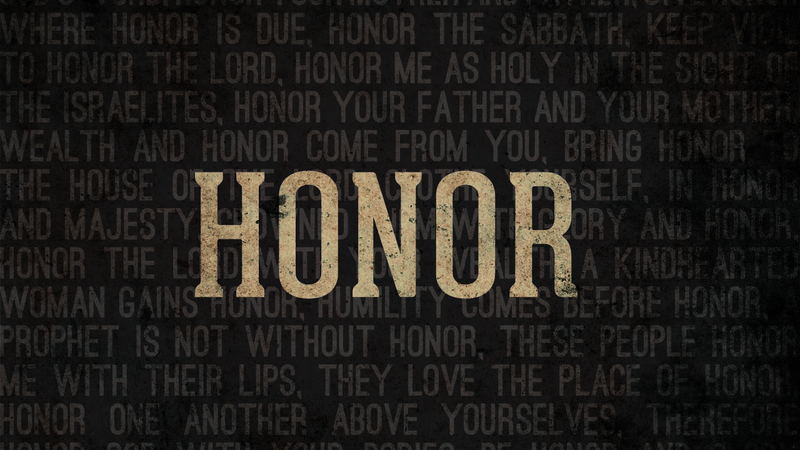 Honor is a powerful thing but is terribly lacking in society, including the Church. Honor is bestowed by the value we see in something, or should I say someone. When I think of honor I think of how I see someone. My honoring someone or lack thereof shows where my value system lies and how my value system works. That is why one person can value and give honor to something or someone else and the next person has no honor or value for it. Pricelessness is in the eyes of the beholder. In my childhood I used to bully and I was bullied. I was dishonored and I dishonored. I bestowed greater and lesser value based on my current viewpoint at the time. You see, honor is truly bestowed and not owed. Yes there are times where you give honor to whom honor is due (see Romans 13:7) but I’ll will talk more about that in another blog. Here I will speak about bestowing honor by placing value on another individual. So the eye cannot say to the hand, “I don’t need you!” Or again, the head can’t say to the feet, “I don’t need you!” But even more, those parts of the body that seem to be weaker are necessary. And those parts of the body that we think to be less honorable, we clothe these with greater honor, and our unpresentable parts have a better presentation. But our presentable parts have no need of clothing. Instead, God has put the body together, giving greater honor to the less honorable, so that there would be no division in the body, but that the members would have the same concern for each other. So if one member suffers, all the members suffer with it; if one member is honored, all the members rejoice with it. And you should not do anything with contention or empty glory, but in humility of mind, let every person esteem his neighbor as better than himself. My best friend is writing a book entitled “Treasure in Certain Vessels” and I believe it is a message that should be heeded these days. Look out for it in the future. It is very hard for people, me included, to really want to offer anything because oftentimes I don’t feel worth anything or that I don’t have anything of worth to offer. At my previous fellowship I was an usher for about 7 or so years but never really felt honored or worth anything but a body to volunteer while the big named people had the seats of honor and this was even more prevalent during conferences where there were big name speakers. Only those in “authority” were honored. Thankfully I’ve received almost complete healing but even today I have moments where I feel a twinge of rejection but that is a paradigm I will need to shift. Also growing up I, like most, children didn’t really have a voice. Didn’t have an opinion. Seen not heard kind of thing. I lost my voice/honor and only recently getting my voice back. But he who enters by the door is the shepherd of the sheep. 3 To him the doorkeeper opens, and the sheep hear his voice; and he calls his own sheep by name and leads them out. For those who feel locked into secret places, God will begin to reward you openly! You have served, sown, volunteered, interceded, kept things close to your heart, been what seems as background noise, and not honored but God sees and is looking through His books and your deeds and your heart is ever before Him. Do not become weary for you will reap, just don’t give him. Honor despite not being honored. Bestow value even when value by others haven’t been bestowed on you. You will reap because God knows you by name! If you have been disregarded all your life and it seems like no one every sees you or honors then I remove all demonic and ungodly labels of religion, witchcraft, and worldly dishonor off of you in Jesus’ name! No more cloak of invisibility and I rebuke it and command it to be removed! No more dishonor of men! No more dishonor of women! No more dishonor of children and the unborn!There is neither male nor female but are one in Christ Jesus! Receive honor by showing honor. Bestow value despite of the lack of value bestowed on you. Sooo the last clip shares just a little bit of the story between Paul Young’s mother and the Priest whose life she saved. I can’t seem to find the rest of the story. It used to be on YouTube but I just can’t find it. So I’ll share what I can remember. Paul Young’s mother goes to the Church that the priest pastors and visits. During the service it was communion time and, being as Paul Young’s mom wasn’t a member she couldn’t take communion, which she understood and was fine with. Near the end of the communion time the priest slowly walks down the aisles to the back row where she was sitting, kneels down and give the bread and wine to Paul Young’s mom in a beautiful act of honoring the woman who saved his life. Wow!! This is so good! It is very interesting the link between receiving honor and having a voice! Love the powerful declarations at the end!! He knows your name!! Hspoy to out this in the forefront of the barking talking points of the mainstream media which continue to speak against HIM by intent. Honor. When was the last time you heard or read about this word? Does it even exist on our culture any more?